Who knows what the future holds? Unfortunately, life just doesn't work that way. Those who prefer to look forward and make preparations for the “just in case” scenarios are often painted as fringe lunatics and doomsday preppers. Taking action and learning about emergency survival food preparation for you and your family should be something every adult takes seriously. There are plenty of normal everyday situations that could occur where having some form of food preparation organized may be your savior. These could be situations such as loss of a job, temporary lay off, extended storm damage or power outage that traps your family at home. Or perhaps you'd just like to be in a position to help another family in need, should the opportunity arise. Then there are Armageddon type scenarios that plague the mind of some. There is no better way to put those fears to rest than to look ahead and prepare for the worst. Whatever your reasons for setting up your emergency survival food stockpile now, this article is here to help. First, lay out your preparation strategy. If you're just getting started in emergency preparation, you may not have more than a day or two worth of food in your cupboard. So if that's the case, building up a 30-day supply of food is a good place to start. If you already have 30-days of emergency rations prepared then the next step will be building up a 6-month or 1-year emergency food kit. The important thing is to start somewhere. Build your supplies up until you've assembled an area dedicated to emergency survival food. If you're into food preservation like I am, I recommend starting out with that or learning how to do it. The Ultimate Dehydrator Cookbook with 398 recipes is certainly a must have for any serious food prepping. Who Are You Food Prepping For? Do you have children in the house? Teens? Older or elderly adults? Infants will require special feeding accommodations like milk or formula, while the elderly may have some unique nutritional needs as well. Map out on paper who you're building a your emergency survival food supply for and any special things you need to prepare for them and yourself. Then consider what it takes to feed that person for a single day. Once you've written down what it takes to feed one person for one day. You'll then need to multiply that by the number of people and the number of days for which you're preparing. What Do You & Your Family Like To Eat? There's no need to live for a month on nothing but rice and beans. You don't want to stock up on 3-months worth of food that your family won't touch with a six-foot pole just because it was cheap. It may keep you alive but you want to enjoy it if possible. So take your food likes and dislikes into consideration as you plan. Don't forget to consider food allergies as well. In an emergency situation you wouldn't want to face an allergic reaction from cross contamination. So better to avoid problem foods altogether if possible. There are dozens of ways to build up a great emergency food stockpile. The easiest, though certainly not the least expensive, is to invest in commercially prepared emergency rations. These are offered by many companies. These kits come as single servings, or a month's worth of food for a single person. There are dozens of options to choose from. The Mountain House Just In Case Classic Assortment Bucket seems to be a popular choice! Another method, requiring a little planning and management, is to simply take what you buy on a weekly basis, and start building up a supply that will last. If you ordinarily use three cans of beans and two boxes of mac 'n' cheese and a jar of peanut butter each week. Then begin buying double that and set the extra aside for your emergency survival food stockpile. You'll need to then manage your stock by rotating it so that your food stays as fresh as possible. Freshness would be a significant advantage in a long-term disaster. Where you may be relying on your emergency rations for weeks, months or even years. Home canning is another less expensive way to build up your emergency rations. Canning is becoming a lost art, so if you're not familiar with how to do it, you're not alone. Canning food in glass jars requires a little education and effort but can allow you to preserve tasty, homemade food for years. Be sure to learn which foods require pressure cooking versus water-bathing methods of preservation. Properly canned goods keep best in cool, dark places between 50 and 70 *F (10 – 21 *C) and are safe to eat for years after canning. A great place to start is get your hands on The Complete Book of Home Preserving. Chocolate: powdered cocoa keeps the best and chocolate bars +70% cocoa will keep for several months. Much longer if frozen. Hot chocolate mix has a shelf life of several years. Mac 'n' cheese: best preserved dried by separating the noodles and cheese. Then vacuum sealing them with O2 absorbers. If you're worried about being able to cook mac 'n' cheese, it can be canned, but it won't have the same texture as freshly made. Under cooking the noodles before canning will help it to be less mushy. Honey: made with natural preservatives, honey will keep indefinitely as long as water never gets near it. Store in very clean, very dry glass jars. If it crystallizes, you can return it to its liquid state with a little heat. Freeze dried fruit: or dehydrated fruit can be a great energy booster and will keep well when stored properly. Hard candy: store with desiccant and vacuum sealing to provide a much-needed pick me up under stressful conditions. Virgin coconut oil: will store for a very long time and provide added fat for recipes when butter isn't available. Spices: if you are having to make all of your food from what you have on hand. You'll be very glad for some extra spices to spice things up. Alcohol: serves many purposes in a disaster scenario and it keeps well. High alcohol content (+20%) will keep the longest and +40% can serve as a disinfectant. Tea: keeps well without special accommodations. To keep it the freshest, store in small quantities with an O2 absorber. Coffee: roasted coffee keeps well in vacuum sealed Mylar bags for up to 2-years. If you rotate it through your emergency rations, you will have good coffee for some time. Beyond that you'll have to store green coffee beans in the same way. Then roast and grind them as needed. Once you've established a good base for emergency rations, you might want to start thinking about adding some comfort foods to your store. For a super quick fix, it's worth investing in this Emergency Food Variety Pack with 104-Servings of all your house hold meal favorites. All meals are easy to prepare and just need water added to them. Best of all, it has a 25-year shelf life! For bulk dry goods that are intended for long-term storage such as wheat, beans, rice and sugar. They can be vacuum sealed and stored in five gallon buckets with O2 absorbers to last for 30-years and more. For the truly prepared minded, a few buckets of wheat and corn will go a long way toward peace of mind. A good Vacuum Sealer is a good investment for anyone serious about their emergency survival food preparations. Sealing foods in smaller quantities not only preserves them longer but allows you to use them a little at a time. Rather than having to use a large container up quickly once you've opened it. Signs to watch for regarding your canned goods are if the can is bulging or the lid has come unsealed. Check for mold or fermentation bubbles in the liquid. If the food rushes out of the can or jar when you open it, there is pressure on the contents that wasn't there when the can or jar was sealed. This is a good indication of bacterial activity causing a chemical reaction. Do not eat it. For total preparedness it's important to think ahead regarding your food preparation during an emergency. If the power was out for three weeks, how would you cook that mac 'n' cheese you took such care to store? Even if you have a power generator for emergencies, stoves and microwaves pull too much energy to use the generator for cooking. A propane or butane camp stove with plenty of fuel cells, or a propane or charcoal grill are great options to have on hand. And don't forget to include a manual can opener in your emergency food kit. Water will be critical to surviving certain types of disaster scenarios. When planning for emergency situations, one liter of water per person per day is a good starting point. You'll need some extra for sanitation and cooking, as well. Be sure you have plenty of water on hand, or a way to obtain water and sanitize it. Sanitation tablets and a filtration system would be a major component of the best emergency food kit. Storage space can be tricky, depending on your housing situation. If at all possible, you'll want to designate a neatly organized room that's specifically for food storage. You'll label your shelves and keep things nicely stocked and rotated. If you don't live in this kind of fairy tale situation. Then you may have to get a little more creative about how you store your emergency survival food. A lot of food can be neatly stored in cardboard boxes, under beds, in the bottoms or tops of closets and under the stairs. You may need to reduce unnecessary clutter to make room for emergency rations. The reward will be worth the effort. 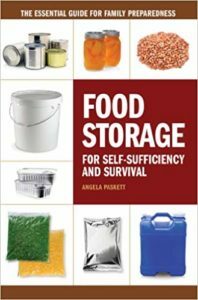 Get started with your copy of Food Storage for Self-Sufficiency and Survival today! Peace of mind is knowing that you have the ability to care for those you love and to be able to reach out to those around you. Especially in their time of need. You'll rest easier at night knowing that whatever tomorrow holds, your family is provided for. So take the steps today to create the best emergency survival food stockpile possible.